I drew Chateau Gaillard several times while we were in Les Andelys. It sits high above the Seine Valley dominating the river and the quintessential French village at its base. Richard the Lionhearted built it to control access to Normandy via the Seine around 1180-1200. No housing could be built until the Chateau aka castle was finished in a record ten years. Imagine a French winter in what tents?! Or sleeping outside for ten years?! The second son of Henry II of England spent most of his life in Normandy even when he became king of England. Legendary characters in Bristish history surround King Richard from his parents Henry II and Eleanor of Aquitane to Robin Hood who came to his aide. The machinations of Richards younger brother, Eleanor’s favorite son -the notorious King John Lackland, and the infamous Sheriff of Nottingham who had the Germans kidnap and held him for ransom on his return from the crusades in the Holy Land are the stuff of many movies. So there it’s sits wrapped in legend glowing in the French sun begging to be drawn. And I did. This was drawn sitting in the warm lounge of the Viking Pride. Talk about cushy urban sketching!! Does not get any better!! Comfy chair, feet up, huge glass windows with incredible views and a glass of wine! What more could you ask for??! Colors used – DS Green apatite, dioxzine purple, Quin gold Quin red orange. 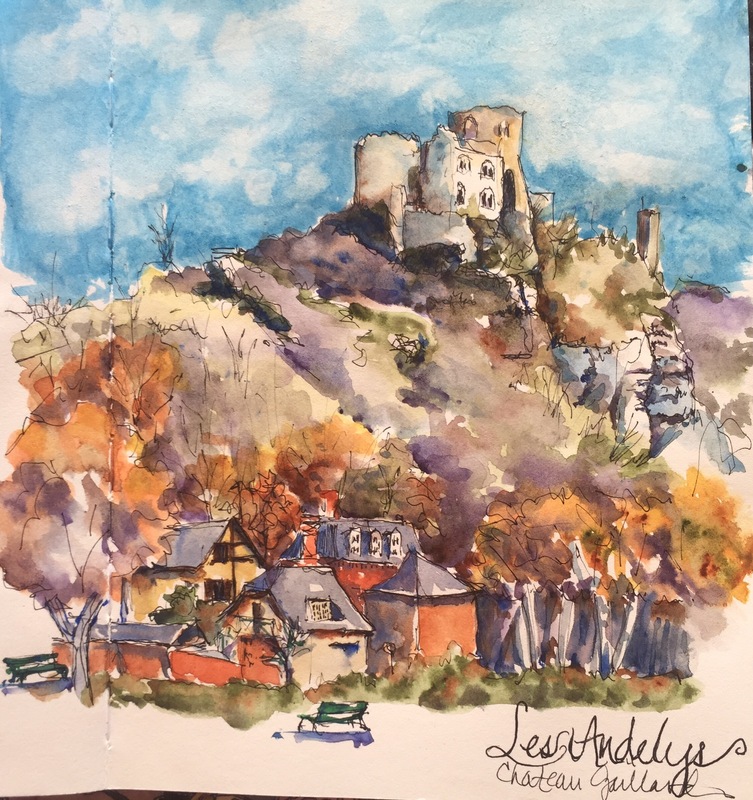 The castle is Winsor yellow and cerulean with raw umber and yellow ochre. Margaret off to enjoy this gorgeous 70 day.